Within my imagination I think Jack Nicholson is one crazy guy. I think he’s the type of guy who listens to jazz and understands it. Or only listens to jazz under water because it makes sense? The poster above comes from the works of Billy Perkins from Austin Texas. I had trouble finding a good link to Perkins so I posted his gig posters page. Perkins has been doing concert posters for almost 20 years now and has a unique comic book style. 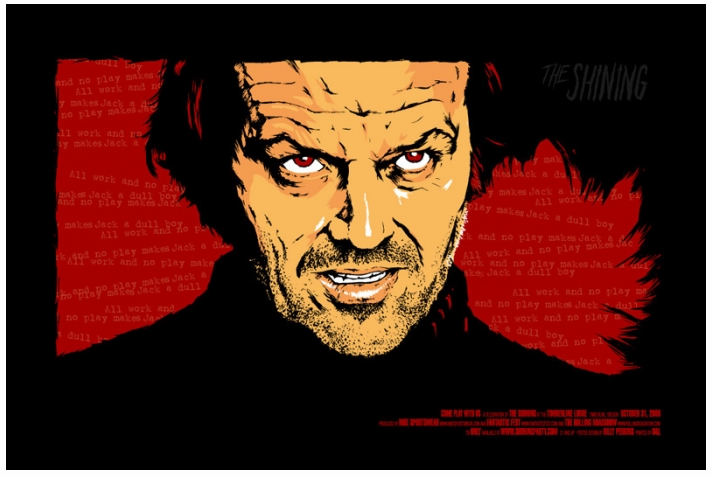 An image of Jack Nicholson in The Shining is an awesome idea for the poster since within that movie Jack Nicholson’s facial expressions tell the entire story without one word. In the past, I created a print based off the textures of an up to date picture of jack Nicholson, it still resembles some similar qualities to this print of The Shining. With the comic book approach, the craze look in the eyes beyond the hard wrinkles of age make for an awesome print.